Leading events promoter, Raymond Gubbay Limited, is delighted to announce the biggest ever series of illuminated festive trails for 2018. Creating a visually spectacular seasonal experience that transforms a heritage landscape has become a speciality for Raymond Gubbay who work with Culture Creative to realise these winter wonderlands. With no fewer than six trails planned at historic and iconic venues across the country, there’s never been a better opportunity to experience these magical outdoor Christmas events. Designed for visitors of all ages to enjoy, the trails provide a unique way to celebrate the festive season with a stunning outdoor experience. New for 2018 ZSL London Zoo will be transformed with a magical illuminated Christmas Trail. The world famous attraction’s mile-long immersive experience opens from 22 November 2018 – 1 January 2019. 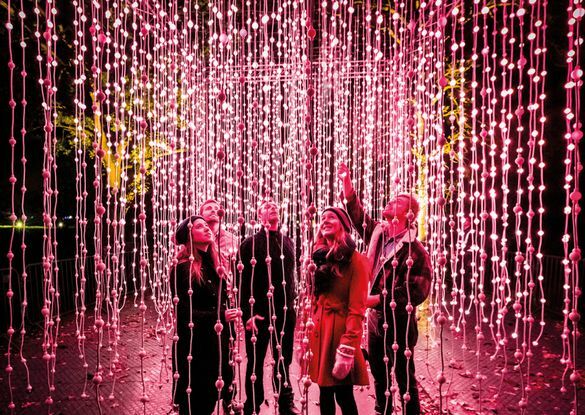 Discover a Light Vortex and contrasting tunnels festooned by a canopy of over 100,000 glistening pea-lights. Wonder at the historic Mappin Terraces as the Magic Mountain springs to life with a blast of colour and playful projections, plus keep a watchful eye out for Father Christmas and his elves along the way. Complete your stroll under the stars with mulled wine or hot chocolate whilst the aroma of roasting chestnuts fills the air. Soak up the atmosphere with a vintage carousel ride*, and other family rides whilst you enjoy traditional treats, before picking up an irresistible gift or two at ZSL London Zoo’s shop. This year Blenheim Palace will be transformed, both inside and out, as part of the biggest Christmas celebrations ever at the Oxfordshire World Heritage Site. With a new indoor Cinderella experience taking over the Palace State Rooms during the day and a bigger and even more ambitious Christmas light trail illuminating the ‘Capability’ Brown landscaped Parkland in the evening; visitors can expect an incredible festive experience from November 2018. New from 23 November 2018 – 6 January 2019, the State Rooms of Britain’s Greatest Palace will be adorned with seasonal decorations as it transforms into a Cinderella experience. Wander beneath garlands into rooms filled with Christmas trees glistening with ornaments, ribbons, baubles, holly and swags of mistletoe… The illuminated trail at Blenheim Palace returns from 23 November 2018 – 1 January 2019, illuminating England’s finest view with a bigger, brighter and more spectacular evening trail than ever before. Visitors can expect over a million pea-lights, lasers and projections. Wander beneath unique tree canopies drenched in seasonal colour and dripping with silvery shards of light, frosty snowflakes, stars and baubles. 23 November – 30 December 2018. The tree-tops will glisten as the gardens and buildings shimmer with seasonal sparkle. Explore the dramatically lit ruins of Beaulieu’s medieval Abbey, discover the flickering flames of the scented Fire Garden Cloister and make a Christmas wish at the Wishing Tree. Visitors will marvel at the Tunnel of Light with its canopy of over 100,000 twinkling pea-lights. Surrounded by sparkling hedges, follow the path towards the Palace House panorama, which will bring to life the exterior of the magnificent Montagu family home. Watch as beams of light dance in time to much-loved Christmas classics and glimpse Father Christmas and his elves who will be greeting visitors from the roof of Beaulieu’s veteran bus. There’s another brand new Christmas light trail in the heart of Kent at the Bedgebury National Pinetum and Forest from 30 November – 30 December 2018. The family-friendly festive trail features dancing fountains and shimmering reflections that cast light into hidden places. Highlights include a spectacular towering Tunnel of Light festooned with thousands of tiny lights as well as a scented Fire Garden, a Mistletoe Moment and much more. There are hidden surprises too – watch out for frosty snowflakes, shimmering stars and gigantic baubles where you least expect them. At the Boardwalk, the giant redwoods are surrounded by a carpet of glowing colour-changing globes. The iconic trees, rising high into the night sky, are brightly illuminated by twinkling lights dancing in time to Christmas classics. Visitors can complete their stroll under the stars with mulled wine or hot chocolate whilst the aroma of roasting chestnuts fills the air. Toast marshmallows at one of the fire pits, ride the vintage Carousel*, and spy Father Christmas and his elf along the way. Christmas at Dunham Massey returns to the historic National Trust property in Cheshire from 30 November – 30 December 2018. Visitors will be greeted by larger-than-life glittering deer, along with the quintessential sights and sounds of Christmas. Walk through a Tunnel of Light festooned whilst the mesmerising voices of Singing Trees can be heard in the distance. The incredible Water Fountain Finale, which takes place on the Lake, is a showcase of water jets and beams of light which dance in time to much-loved Christmas classics. There are lots of other festive surprises on offer including Bubbles on the Bridge, playful ribbons of colour-changing lights and an incredible scented Fire Garden. The historic courtyard will once again house festive food outlets as well as a vintage carousel*. Visitors can stroll under the stars with spiced cider, mulled wine or hot chocolate whilst the aroma of roasting chestnuts fills the air. There are also illuminated festive trails taking place at the Royal Botanic Gardens, Kew and the Royal Botanic Garden, Edinburgh. Additional charges apply for vintage rides and purchases from food concessions. The design team behind these festive displays is Culture Creative, who have previously worked with English Heritage, the National Trust, the Royal Botanic Gardens, Kew, Forestry Commission and the National Trust for Scotland. For more information about Culture Creative please see their website culturecreative.co.uk.